Order 2 Per Page Duplicate Manual Cheques - Receive 25% More FREE! 2 Per Page Duplicate Manual Cheques. 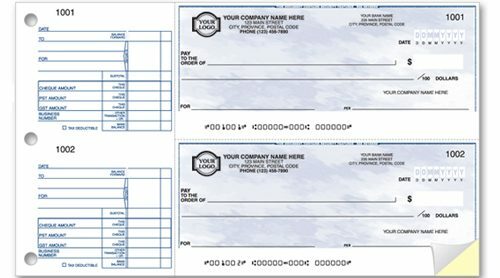 Two per page manual duplicate cheques are great for keeping around the office or taking with you in the available two per page duplicate manual cheque binder. Choice of 5 Background Colours. All Ultra Security features are listed on the back of our cheques!!! Toner Adhesion- Fuses toner on paper surface. Makes it difficult to change data by scraping or using tape.- Invisible Fibers- Fibers are built into the paper. Visible under UV light and are a useful authentication tool. Special chemical indicators in the paper appear as stains if exposed to common ink solvents. Micro Print- Lines appear broken to the human eye. When scanned or copied they will often blur. Security Warning- Detailed list helps verify security features. Serves as a potential deterrent to criminals.